Allow me a moment to introduce myself. Ø What was your first job? Ø What gets you fired up? Ø What risks are worth taking? Working in the studio with no phone and no distractions and no time limits on how long I can stay there. What is your artistic discipline? There are a few. Ive always been creative and studied design at university with an honours degree in set design for theatre. I’m a self taught artist and tend to stick to acrylic and watercolour though pastels and oils also feature. I’m fairly new to watercolours and love the fluidity of it. 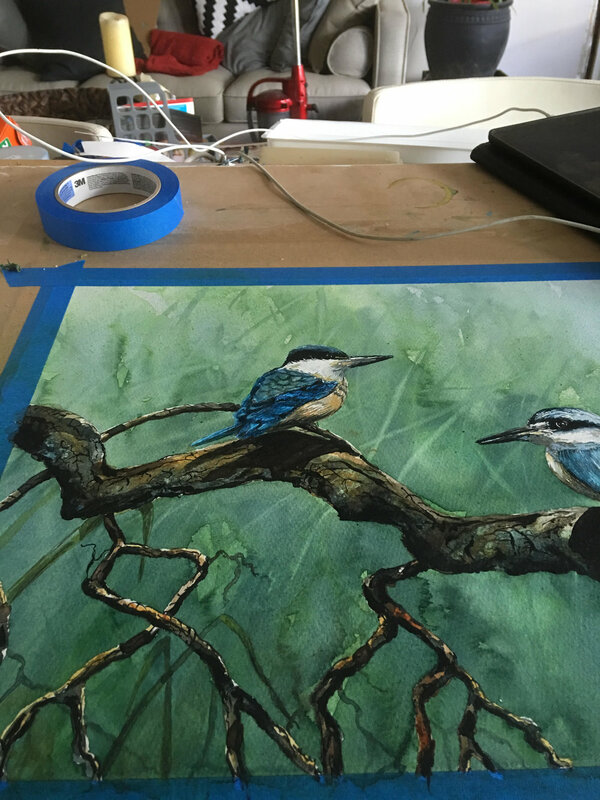 Switching between acrylic and watercolour has its challenges as they both require very different application techniques. My very first job was a newspaper round but then moved to working in a bakery at the early hours of the morning to pay my way through university. I’m definitely not an early morning person! Ø What are some of your technical/artistic/personal “rules” that you never break? Honesty and integrity have always remained my personal values. When it comes to my art, Ive always been of the opinion that one must create work for fun, learning and expression and not for the dollar value. It gives me some sense of happiness whenever I gift or sell a painting knowing that a part of me has a good home and is appreciated for what it is. Ø What are some things you’ve had to unlearn? Wow. Lots. Ive really had to learn how to let go of things. That’s quite a challenge when someone such as me becomes attached to ideas, ideals, art and people. Learning to let go of who I thought I was, society’s ideals and people’s expectations. I’m my art Ive had to unlearn perfection and perceived perfection. Learning to stop adding when you thinks it’s done. Ø What is next? Where are you heading with your work? I’m just starting... what is next? Well I think I’d love to explore more. Explore more self expression. I’m just learning that I do have a style and that I need to let people appreciate it. For years I always thought that I wasn’t good enough to sell and always had in my mind that “I will never be as good as them”. In actuality I’m heading in a direction of creating and refining my brand. I’m currently developing a Kimberley series in the north west of Western Australia. Manners. One should always be polite and have manners. Oh and phone calls. These days people rely too much upon sms and email and the like and it’s very hard to get someone’s intentions this way. I love a good chat on the phone or over coffee. Emotions and intentions are so easily read this way and communication is all about body language and tone. The other thing that should be done the old fashioned way is dating. No one seems to date properly anymore, I dunno, call me old fashioned and a romantic if ya like. I get fired up in an angry way every time I read an article that entails feminine repression of any kind of which my male partner lovingly bears the brunt of my inequality rage despite the fact that he himself is a raging feminist. And I get fired up in an arty way every time I go to Melbourne and see all the works of beautiful friends and colleagues and how they have developed and progressed and particularly fired up after storing lots of energy from the cheap dumplings I eat exclusively whilst there like a bear preparing for a cold hard winter. Ø When have you been most satisfied in your career? Right now. As soon as I stopped trying to do things that I thought people would like, my own style came through and it’s never been as true as it is now, I get to see myself improving with every new work and it's thrilling to be able to surprise myself and be expressive without concern. Ø What is the most significant project or accomplishment that you’ve achieved in your career? Simply getting to this point. It’s such a hard thing to be motivated to create every day that each day feels like an achievement. Ooo and working recently with the lovely Jack Francheschini @jackfran not only did he invite me to be part of an exhibition but he taught me a lot about painting on the street and it was a joy to work with such a wonderful artist and human. Ø How do you measure success? By the amount of happiness I glean not only from work itself but from how well it lends joy to all of the other parts of my life, and my family's, life. Ø What kind of art do you enjoy most? I enjoy works with a strong feminine message but I also like art that can shock or accurately reflect a pointed topic, I often find myself drawn to political art or psychedelic vintage band posters. Which sounds weird, I don’t even think most people would consider that a form of art but they can be so beautiful. In a gallery however most of the time works with beautiful colour fields can make me feel all the feels.